Sometimes I’m just BUSY. I’m working on two master’s degrees, you see, on top of completing 32-36 (unpaid) hours a week at my current internship. So, I’m not too frilled about it, but sometimes I have to resort to FROZEN FOOD. 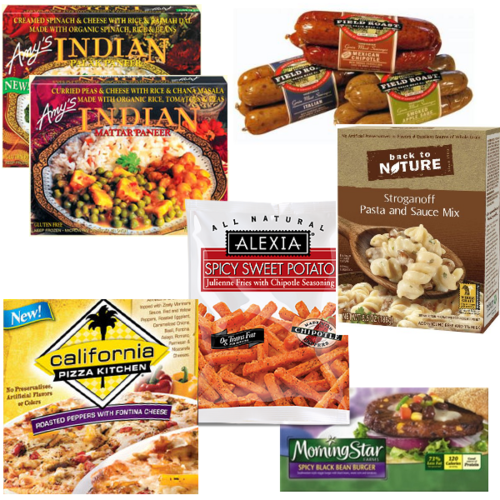 From left to right: Amy’s Indian Dinners, Field Roast Sausages that I like to crumble and cook with Back to Nature’s Stroganoff Pasta Mix, California Pizza Kitchen’s Roasted Peppers with Fontina Cheese Pizza, and Alexia’s Spicy Sweet Potato Fries with Morning Star’s Spicy Black Bean Burger. While these are all great for FROZEN food, I’ve had a better week than that. So far I’ve made Spinach Enchiladas and Southwestern Falafels, and a delicious cabbage salad is awaiting me in the near future.